During total solar eclipses, the moon moves between the earth and the sun, completely blocking out the sun's light. But that's not all that happens. Recently scientist proved that when this happens, the moon sends waves rippling through the earth's atmosphere that pile up like the bow waves on a boat. Once again, science gets poetic. Many have compared the moon, usually the new moon, to a boat sailing through the skies. And under certain conditions, it seems, the moon has the same effect on the earth as a boat cutting through the water. It creates waves in the upper atmosphere that pile up into bow waves and stern waves. When a boat moves through the water, it creates waves. They travel outwards from the boat in all directions. Often the boat travels faster than the waves, resulting in bow waves that pile up at the front of the book. Most people have seen them riding up the front of the boat in a series of 'folds'. Boats also create stern waves, but since the boat is traveling away from the waves, they fan out widely behind the boat. The moon doesn't touch the earth's atmosphere, and thus, much of the time it doesn't have this effect. During a solar eclipse, though, the moon does something that does directly touch the atmosphere. It blocks out the sun, and causes a wide temperature dip with its shadow. This temperature change causes 'acoustic gravity waves' in the atmosphere. 'Acoustic gravity waves' are often confused with waves of gravity. Waves of gravity are actual waves in gravitational force itself, due to moving mass. These waves aren't present (or at least aren't detectable) during the eclipse. Acoustic-gravitational waves are what happens when temperature changes in a fluid, in this case the atmosphere. When a fluid changes temperature, it also changes density. This causes the section that has a different temperature to rise (if it's hot) and fall (if it's cool or as it cools) as gravity pulls it. The momentum of the gravitational pull causes it to fall past it natural density level, and often it rebounds. These fluctuations, a little like ripples on the surface of a drum, cause waves that travel outwards. In the atmosphere, these are called acoustic gravity waves. 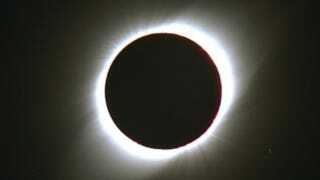 The moon's shadow causes temperature drops across large swaths of the earth during a solar eclipse. Scientists have thought that this could cause acoustic waves, but in 2009 finally got a solar eclipse big enough to measure it. They found that the moon did cause acoustic gravity waves in the atmosphere. These waves have cycles that last 3 to 5 minutes, and they travel at 100 meters per second. They don't travel fast enough to outrun the shadow of the moon, though. Because the moon's shadow moves faster than the waves, they pile up at the leading edge of the motion and fan out at the trailing edge, just like a boat. Via eHow and Geophysical Research Letters.